Breathing moves air in and out of the lungs. Oxygen goes in, carbon dioxide is flushed out. An exchange occurs within our internal environment. 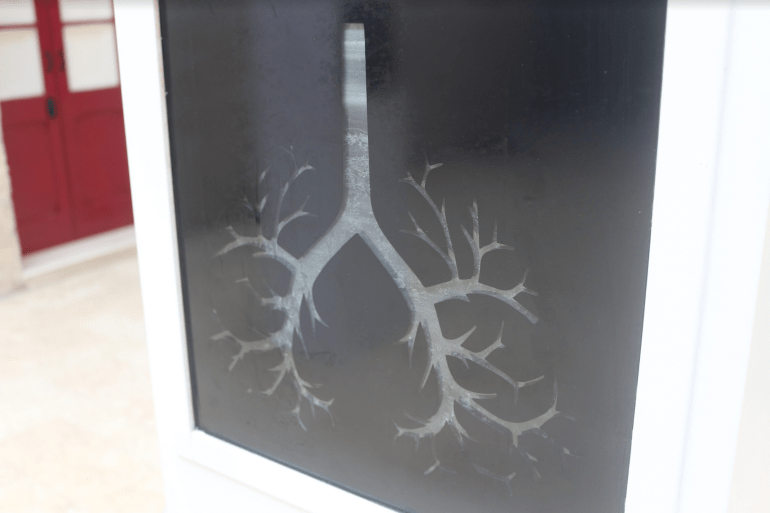 Onfoħ is an installation that explores the phenomenon of carbon emissions through human respiration. Carbon emissions are loosely defined as the release of greenhouse gases and their precursors into the atmosphere over a specified area and time. This notion is usually linked to the burning of fossil fuels like natural gas, crude oil, and coal. In short—human activity. From the very beginning, humans have altered their environment. In fact, an average person takes 12 to 20 breaths per minute, amounting to an average of 23,040 breaths per day. The world’s population collectively breathes out around 2500 million tonnes of carbon dioxide each year, around 7% of the annual carbon dioxide tonnage produced by burning fossil fuels. Although the carbon dioxide produced through breathing is part of a closed loop in which our output is matched by the input from the food we eat, it can be used as a metaphor to visualise other unseen outputs from other man-made sources: transportation, electricity, heating, water consumption, food production. Onfoħ was designed to engage citizens and address an overwhelmingly challenging environmental problem of our time—our inability to visualise our own carbon footprint. The work does this by showing that which is usually unseen—the physical manifestation of carbon emissions. The installation consisted of five plinth-like structures, each housing a glass container of lime water. Stencilled onto the pillars were illustrations of lungs, each consecutive pair having decreased surface areas, conveying a sense of degeneration. When the audience interacted with the installation, breathing into the lime water and adding carbon dioxide, they triggered a chemical reaction that produced insoluble calcium carbonate. The clear solution turned milky, making the invisible visible. Humans contribute constantly to carbon-based, hazardous waste production, and the installation demanded that they face that reality. Note: The installation was displayed as part of a collective exhibition entitled Human Matter, hosted by the Malta Society of Arts at the end of last year. David Falzon, Matthew Schembri and Annalise Schembri teamed up to work on this artwork as soon as they finished reading for an MFA in Digital Arts (Faculty of Media and Knowledge Sciences, University of Malta).